Ships in 6 to 7 business days. 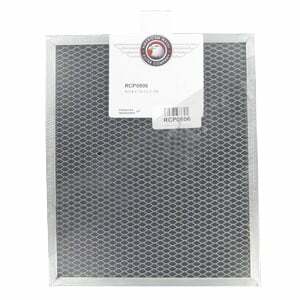 The Filters Fast FFMH-002 Oven Hood Range Filter is the compatible replacement for the American Metal Filter Company RCP0806. This charcoal carbon filter can be used in a variety of non-duct oven range hoods, and microwave ovens that require odor elimination. By recirculating the air inside your kitchen, the FFMH-002 has no problem removing bothersome grease, smoke and other unwanted odors with ease. The FFMH-002 also meets and/or exceeds compatible OEM range hood filters in performance and longevity. Dimensions: 8 3/4" x 10 1/2" x 3/8"